Beau Mistral won the first race at Saratoga for Dave Collins of Lenox, MA. The two-year-old Irish-bred filly took the opener at Nottingham Racecourse in a simulcasted British maiden race that the fan of international horse racing wouldn’t bet. 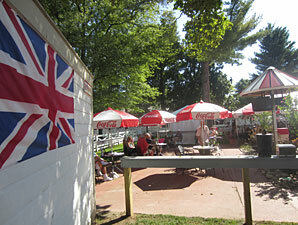 “I would never be here if it wasn’t for this,” Collins said about Saratoga Racecourse in relation to the televised horse racing from the UK that plays each morning beginning at about 8:00 am at The Post, the new open-air paddock-side bar. Caption: Simulcasting of UK horse racing in the mornings has attracted small crowds. York’s Ebor Festival, featuring the gr. 2 Sportingbet.com Great Voltigeur Stakes won by Sea Moon, the gr. 1 Juddmonte International Stakes won by Twice Over and the gr. 3 Sportingbet.com Acomb Stakes won by Entifaadha, accounted for one-third of the pre-live racing program. There was action from Carlisle and Nottingham, too. About 25 people, of which maybe 10 bet, made up the audience. “They need to bring some chairs here so the people can enjoy it,” complained Mike Opalenik of Springfield, MA. “I can’t stand here until 1 pm,” he said. Yet, he and his companion, Maida Boudreau, watched intently, leaning up against a fence post. Regardless, the majority represented people that entered the track early and decided to wait in the area instead of exiting when the gates closed after breakfast. Except for the sparse occupancy, a British flag on the Shake Shack’s rest rooms’ wall and a few promotional signs, the “simulcasting” Post looks like the “live racing” Post – a circular bar under a red and white tent. There are half dozen tables with umbrellas scattered around and overhead TV monitors that are difficult to view in the sun – not the most inviting accommodation for events that, when experienced in person, are known for their hospitality. The inhospitable betting opportunities that were presented locally, which Collins complained about, resulted in six short prices and three exactas ranging from 18.40 to 11.60. Odds-on Bridgetown beat only five horses in the feature and one, the one with the best chance of beating him, dwelt at the break, losing all chance of winning. The most bet-able race – the last race – had a gate scratch and disqualification. 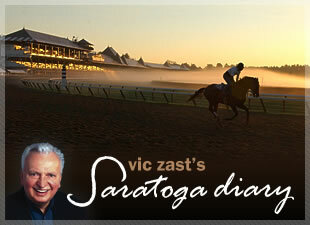 On Thursday, two steeplechases start things off at the Spa and there’s only one maiden race. You can tell that the six weeks of upstate racing is more than halfway concluded because 52 of the 93 entered horses have run at the meet already.